A stent is provided with a composition which includes melatonin and paclitaxel for use in treating smooth muscle cell proliferation, such as stenosis and preventing restenosis in vascular vessels. The present invention relates to a stent useful for expanding a vessel lumen of a subject and treating restenosis therein. A stent is commonly used as a tubular structure introduced inside the lumen of a vessel to relieve an obstruction. Commonly, stents are inserted into the lumen of the vessel in a non-expanded form and are then expanded autonomously (or with the aid of a second device) in situ. When a stent is used to expand a vascular lumen, restenosis (re-narrowing) may occur. Restenosis of an artherosclerotic coronary artery after a stand-alone angioplasty may occur in 10-50% of patients within 6 months, requiring either further angioplasty or coronary artery bypass graft. It is presently understood that the process of fitting a bare stent (without any drug), besides opening the artherosclerotically obstructed artery, also injures resident coronary arterial smooth muscle cells (SMC). In response to this trauma, adhering platelets, infiltrating macrophages, leukocytes, or the smooth muscle cells (SMC) themselves release cell derived growth factors with subsequent proliferation and migration of medial SMC through the internal elastic lamina to the area of the vessel intima. Further proliferation and hyperplasia of intimal SMC and, most significantly, production of large amounts of extracellular matrix over a period of 3-6 months results in the filling in and narrowing of the vascular space sufficient to significantly obstruct coronary blood flow. To reduce or prevent restenosis, stents are provided with a means for delivering an inhibitor of SMC proliferation i.e. melatonin and paclitaxel directly to the wall of the expanded vessel. Such delivery means include, for example, via the struts of a stent, a stent graft, grafts, stent cover or sheath, composition with polymers (both degradable and nondegrading) to hold the drug to the stent or graft or entrapping the drug into the metal of the stent or graft body which has been modified to contain micropores or channels. Other delivery means include covalent binding of the drug to the stent via solution chemistry techniques (such as via the Carmeda process) or dry chemistry techniques (e.g. vapor deposition methods such as rf-plasma polymerization) and combinations thereof. Examples of some means for delivery are mentioned in patent document U.S. Pat. No. 6,599,314. Inhibitors of SMC proliferation include sirolimus (or rapamycin, an immunosuppressive agent) and paclitaxel (or taxol, an antiproliferative, anti-angiogenic agent). Other agents which have demonstrated the ability to reduce myointimal thickening in animal models of balloon vascular injury are heparin, angiopeptin (a somatostatin analog), calcium channel blockers, angiotensin converting enzyme inhibitors (captopril, cilazapril), cyclosporin A, trapidil (an antianginal, antiplatelet agent), terbinafine (antifungal), colchicine (antitubulin antiproliferative), and c-myc and c-myb antisense oligonucleotides. In view of the prior art, there is a need for a new types of inhibitor of stenosis and restenosis, delivered via a stent. One embodiment of the invention is a medical stent provided with a composition comprising melatonin and paclitaxel. Another embodiment of the invention is a medical stent as described above, wherein said stent is provided with one or more cavities configured to contain and release said composition. Another embodiment of the invention is a medical stent as described above, wherein said stent is at least partly made from a material which is biodegradable in situ. Another embodiment of the invention is a medical stent as described above, wherein said stent comprises a magnesium based alloy. Another embodiment of the invention is a medical stent as described above, wherein said stent is at least partly made from a material which is non-biodegradable in situ. Another embodiment of the invention is a medical as described above, wherein said stent is at least partly provided with said composition. Another embodiment of the invention is a use of a composition comprising melatonin and paclitaxel, for the preparation of a medicament for providing a medical stent for treating smooth muscle cell, SMC, proliferation. Another embodiment of the invention is a use according as described above, wherein said stent is as defined above. Another embodiment of the invention is a kit comprising a) at least one medical stent and b) a composition comprising melatonin and paclitaxel. Another embodiment of the invention is a kit as described above, wherein said stent is as defined above. Another embodiment of the invention is a medical stent according, a use, or a kit as described above, wherein said composition further comprises one or more slow release agents to facilitate slow release of inhibitor. Another embodiment of the invention is a medical stent according, a use, or a kit as described above, wherein said slow release agent is any of magnesium alloys, poly(glycolic) acid, poly(lactic acid) or in general glycolic- and lactic acid based polymers, copolymers, poly caprolactones and in general, poly hydroxyl alkanoate,s poly(hydroxy alcanoic acids), Poly(ethylene glycol), poly vinyl alcohol, poly(orthoesters), poly(anhydrides), poly(carbonates), poly amides, poly imides, poly imines, poly(imino carbonates), poly(ethylene imines), polydioxanes, poly oxyethylene(poly ethylene oxide), poly(phosphazenes), poly sulphones, lipids, poly acrylic acids, poly methylmethacrylate, poly acryl amides, poly acrylo nitriles (Poly cyano acrylates), poly HEMA, poly urethanes, poly olefins, poly styrene, poly terephthalates, poly ethylenes, poly propylenes, poly ether ketones, poly vinylchlorides, poly fluorides, silicones, poly silicates(bioactive glass), siloxanes (Poly dimethyl siloxanes), hydroxyapatites, lactide-capronolactone, natural and non natural poly aminoacids poly β-aminoesters, albumins, alginates, cellulose/cellulose acetates, chitin/chitosan, collagen, fibrin/fibrinogen, gelatin, lignin, protein based polymers, Poly(lysine), poly(glutamate), poly(malonates), poly(hyaluronic acids), Poly nucleic acids, poly saccharides, poly(hydroxyalkanoates), poly isoprenoids, starch based polymers, copolymers thereof, linear, branched, hyperbranched, dendrimers, crosslinked, functionalized derivatives thereof, or hydrogels based on activated polyethyleneglycols combined with alkaline hydrolyzed animal or vegetal proteins. Another embodiment of the invention is a medical stent according, a use, or a kit as described above, wherein said slow release agent is a biodegradable poly(ester amide) copolymer. Another embodiment of the invention is a medical stent according, a use, or a kit as described above, wherein said melatonin is a mixture of at least one melatonin analogue optionally together with melatonin. Another embodiment of the invention is a medical stent according, a use, or a kit as described above, wherein said paclitaxel is a mixture of at least one paclitaxel analogue optionally together with paclitaxel. Another embodiment of the invention is a medical stent according, a use, or a kit as described above, wherein a melatonin analogue is any of 2-iodomelatonin, 6-chloromelatonin, 6,7-dichloro-2-methylmelatonin and 8-hydroxymelatonin. wherein R is any of Propionyl, Isobutyryl, Valeryl, Hexanoyl, Octanoyl, Decanoyl, Tridecanoyl, Methoxyacetyl, Methylthioacetyl, Methylsulfonylacetyl Acetoxyacetyl, Ethylformyl, Monosuccinyl, Crotonoyl, Acryloyl, Cyclopropanecarbonyl Cyclobutanecarbonyl, Cyclopentanecarbonyl, Cyclohexanecarbonyl, Hydrocinnamoyl, trans-Cinnamoyl, Phenylacetyl, Diphenylacetyl, Benzoyl 2-Chlorobenzoyl, 3-Chlorobenzoyl, 4-Chlorobenzoyl, 3,4-Dichlorobenzoyl, 3,5-Dichlorobenzoyl, 2,4-Dichlorobenzoyl, 3,5-Dibromobenzoyl, 4-Fluorobenzoyl, 3-Trifluoromethylbenzoyl, 4-Trifluoromethylbenzoyl, 3-Nitrobenzoyl, 4-Nitrobenzoyl, 3-Dimethylaminobenzoyl, 3-Methoxybenzoyl, 1-Naphthoyl, 2-Naphthoyl, 2-Quinolinecarbonyl, 3-Quinolinecarbonyl, 4-Quinolinecarbonyl, Indole-3-acetyl, Pyrrole-2-carbonyl, 1-Methyl-2-pyrrolecarbonyl, 2-Furoyl, 5-Bromofuroyl, 5-Nitrofuroyl, 3-Thiophenecarbonyl, 2-Thiophenecarbonyl, 2-Thiopheneacetyl, Picolinoyl, Isonicotinoyl, 5,6-Dichloronicotinoyl, 2-Methylnicotinoyl, 6-Methylnicotinoyl, 5-Bromonicotinoyl, 2-Pyrazinecarbonyl, Isobutyryl, Valeryl, Methoxyacetyl or Cyclohexanecarbonyl. Another embodiment of the invention is a medical stent according, a use, or a kit as described above, wherein the concentration of melatonin present on the stent is between 0.005 and 2 micrograms inclusive melatonin/mm2. Another embodiment of the invention is a medical stent according, a use, or a kit as described above, wherein the concentration of paclitaxel on the stent is between 0.001 and 0.2 micrograms inclusive paclitaxel/mm2. Another embodiment of the invention is a medical stent according or a kit as described above, suitable for use in inhibiting SMC proliferation. Another embodiment of the invention is a medical stent according, a use, or a kit as described above, wherein said SMC proliferation is restenosis or stenosis. Another embodiment of the invention is a medical stent according, a use, or a kit as described above, wherein the stent is placed in an artery or vein. FIG. 1: G66/11—images from angiography. Left: after stent implantation into LAD und CX arteries. Right: control angiography after four weeks. FIG. 2: G66/11—images from LAD histology. Three samples per stent. HE and Masson Goldner staining. FIG. 3: G66/12—Images from angiography. Left: after stent implantation into LAD und CX arteries. Right: control angiography after four weeks. FIG. 4: G66/12—Images from LAD histology. Three samples per stent. HE and Masson Goldner staining. FIG. 5: G66/13—Images from angiography. Left: after stent implantation into LAD und CX arteries. Right: control angiography after four weeks. FIG. 6: G66/13—Images from LAD histology. Three samples per stent. HE and Masson Goldner staining. FIG. 7: G66/14—Images from angiography. Left: after stent implantation into LAD und CX arteries. Right: control angiography after four weeks. FIG. 8: G66/14—Images from LAD histology. Three samples per stent. HE and Masson Goldner staining. FIG. 9: G66/15—Images from angiography. Left: after stent implantation into LAD und CX arteries. Right: control angiography after four weeks. FIG. 10: G66/15—Images from CX histology. Three samples per stent. HE and Masson Goldner staining. FIG. 11: G66/16—Images from angiography. Left: after stent implantation into LAD und CX arteries. Right: control angiography after four weeks. FIG. 12: G66/16—Images from CX histology. Three samples per stent. HE and Masson Goldner staining. FIG. 13: G66/17—Images from angiography. Left: after stent implantation into LAD und CX arteries. Right: control angiography after four weeks. FIG. 14: G66/17—Images from CX histology. Three samples per stent. HE and Masson Goldner staining. FIG. 15: G66/18—Images from angiography. Left: after stent implantation into LAD und CX arteries. Right: control angiography after four weeks. FIG. 16: G66/18—Images from CX histology. Three samples per stent. HE and Masson Goldner staining. FIG. 17: G66/35—Images from angiography. Left: after stent implantation into LAD und CX arteries. Right: control angiography after four weeks. FIG. 18: G66/35—Images from LAD histology. Three samples per stent. HE and Masson Goldner staining. FIG. 19: G66/35—Images from CX histology. Three samples per stent. HE and Masson Goldner staining. FIG. 20: G66/36—Images from angiography. Left: after stent implantation into LAD und CX arteries. Right: control angiography after four weeks. FIG. 21: G66/36—Images from LAD histology. Three samples per stent. HE and Masson Goldner staining. FIG. 22: G66/36—Images from CX histology. Three samples per stent. HE and Masson Goldner staining. FIG. 23: G66/37—Images from angiography. Left: after stent implantation into LAD und CX arteries. Right: control angiography after four weeks. FIG. 24: G66/37—Images from LAD histology. Three samples per stent. HE and Masson Goldner staining. FIG. 25: G66/37—Images from CX histology. Three samples per stent. HE and Masson Goldner staining. FIG. 26: G66/39—Images from angiography. Left: after stent implantation into LAD und CX arteries. Right: control angiography after four weeks. FIG. 27: G66/39—Images from LAD histology. Three samples per stent. HE and Masson Goldner staining. FIG. 28: G66/39—Images from CX histology. Three samples per stent. HE and Masson Goldner staining. FIG. 29: G66/40—Images from angiography. Left: after stent implantation into LAD und CX arteries. Right: control angiography after four weeks. FIG. 30: G66/40—Images from LAD histology. Three samples per stent. HE and Masson Goldner staining. FIG. 31: G66/40—Images from CX histology. Three samples per stent. HE and Masson Goldner staining. FIG. 32: G66/41—Images from angiography. Left: after stent implantation into LAD und CX arteries. Right: control angiography after four weeks. FIG. 33: G66/41—Images from LAD histology. Three samples per stent. HE and Masson Goldner staining. FIG. 34: G66/41—Images from CX histology. Three samples per stent. HE and Masson Goldner staining. FIG. 35: G66/42—Images from angiography. Left: after stent implantation into LAD und CX arteries. Right: control angiography after four weeks. FIG. 36: G66/42—Images from LAD histology. Three samples per stent. HE and Masson Goldner staining. FIG. 37: G66/42—Images from CX histology. Three samples per stent. HE and Masson Goldner staining. FIG. 38: G66/43—Images from angiography. Left: after stent implantation into LAD und CX arteries. Right: control angiography after four weeks. FIG. 39: G66/43—Images from LAD histology. Three samples per stent. HE and Masson Goldner staining. FIG. 40: G66/43—Images from CX histology. Three samples per stent. HE and Masson Goldner staining. FIG. 41: G66/45—Images from angiography. Left: after stent implantation into LAD und CX arteries. Right: control angiography after four weeks. FIG. 42: G66/45—Images from LAD histology. Three samples per stent. HE and Masson Goldner staining. FIG. 43: G66/45—Images from CX histology. Three samples per stent. HE and Masson Goldner staining. FIG. 44: G66/46—Images from angiography. Left: after stent implantation into LAD und CX arteries. Right: control angiography after four weeks. FIG. 45: G66/46—Images from LAD histology. Three samples per stent. HE and Masson Goldner staining. FIG. 46: G66/46—Images from CX histology. Three samples per stent. HE and Masson Goldner staining. FIG. 47: G66/34—Images from angiography. Left: after stent implantation into LAD und CX arteries. Right: control angiography after four weeks. FIG. 48: G66/34—Images from LAD histology. Three samples per stent. HE and Masson Goldner staining. FIG. 49: G66/28—Images from angiography. Left: after stent implantation into LAD and CX arteries. Right: control angiography after four weeks. FIG. 50: G66/28—Images from LAD histology. Three samples per stent. HE and Masson Goldner staining. FIG. 51: G66/29—Images from angiography. Left: after stent implantation into LAD und CX arteries. Right: control angiography after four weeks. FIG. 52: G66/29—Images from LAD histology. Three samples per stent. HE and Masson Goldner staining. FIG. 53: G66/30—Images from angiography. Left: after stent implantation into LAD and CX arteries. Right: control angiography after four weeks. FIG. 54: G66/30—Images from LAD histology. Three samples per stent. HE and Masson Goldner staining. FIG. 55: G66/31—Images from angiography. Left: after stent implantation into LAD and CX arteries. Right: control angiography after four weeks. FIG. 56: G66/31—Images from CX histology. Three samples per stent. HE and Masson Goldner staining. FIG. 57: G66/32—Images from angiography. Left: after stent implantation into LAD and CX arteries. Right: control angiography after four weeks. FIG. 58: G66/32—Images from CX histology. Three samples per stent. HE and Masson Goldner staining. FIG. 59: G66/33—Images from angiography. Left: after stent implantation into LAD und CX arteries. Right: control angiography after four weeks. FIG. 60: G66/33—Images from CX histology. Three samples per stent. HE and Masson Goldner staining. FIG. 61: G66/34—Images from angiography. Left: after stent implantation into LAD und CX arteries. Right: control angiography after four weeks. FIG. 62: G66/34—Images from CX histology. Three samples per stent. HE and Masson Goldner staining. FIG. 63: Calibration of the CellTiter 96 One solution cell proliferation assay for human coronary artery smooth cells. OD 490 nm, absorbance units recorded at 490 nm. Cells were stimulated with 10 ng/ml of PDGF-BB for 24 h prior to analysis. FIG. 64: 1 mM of Melatonin inhibits the proliferation of human coronary artery smooth muscle cells. Cells were stimulated with 10 ng/ml of PDGF-BB during 24 h before measurement. OD 490 nm, absorbance units recorded at 490 nm. DMSO: negative control, cells were incubated with 0.1% of pure DMSO. Error bars represent the standard deviation (SD). All samples were made in triplicate. FIG. 65: Melatonin up to 10 mM strongly decreased the number of human coronary artery smooth muscle cells in culture. Cells were pre-incubated with Melatonin for 120 h (5 days) before measurement and were stimulated with 10 ng/ml of PDGF-BB during either 24 h or 48 h before measurement. OD 490 nm, absorbance units recorded at 490 nm. Error bars represent the standard deviation (SD). All samples were assessed in triplicate. FIGS. 66(A) and (B): Melatonin strongly inhibits the proliferation of human coronary endothelial cells in culture. M, Melatonin; OD 490 nm, absorbance units recorded at 490 nm. (A) cells were incubated 36 hours before measurement and stimulated either 24 h or 48 h with 10 ng/ml of VEGF-A. DMSO: negative control, cells were incubated with 1% of pure DMSO. (B) Cells were incubated for 48 hours before measurement and stimulated for 24 h with VEGF-A (10 ng/ml). Error bars represent the standard deviation (SD). All samples were assessed in triplicate. FIG. 67: Increasing concentrations of Melatonin do not induce any cytotoxic effects on HCAEC or on HCASMC. (A) HCAEC; (B) HCASMC. M: Melatonin; RFU, fluorescence units recorded at an excitation wavelength of 560 nm and an emission wavelength of 590 nm. Error bars represent the standard deviation (SD). All samples were assessed in triplicate. FIG. 68: Melatonin inhibits [3H]-thymidine incorporation of HUVEC stimulated with VEGF-A. M: Melatonin; cpm, counts recorded for each sample using a beta-counter. Error bars represent standard deviation (SD). All samples were assessed in triplicate. FIG. 69: Melatonin does not affect migration of human coronary artery endothelial cells towards VEGF-A. Human coronary artery endothelial cells were incubated for 48 hours with 2 mM of Melatonin prior to migration. Cells were allowed to migrate 4 hours (see methods) towards 10 ng/ml of VEGF-A. For Melatonin treated cells, Melatonin (2 mM) was present in both the upper and the lower chamber. Error bars represent the standard deviation of cell numbers counted in 30 power fields/grids per group. Unless defined otherwise, all technical and scientific terms used herein have the same meaning as is commonly understood by one of skill in the art. All publications referenced herein are incorporated by reference thereto. All patents and patent applications referenced herein are incorporated by reference herein in their entirety including the drawings. The articles “a” and “an” are used herein to refer to one or to more than one, i.e. to at least one of the grammatical object of the article. By way of example, “a stent” means one stent or more than one stent. The recitation of numerical ranges by endpoints includes all integer numbers and, where appropriate, fractions subsumed within that range (e.g. 1 to 5 can include 1, 2, 3, 4 when referring to, for example, a number of stents, and can also include 1.5, 2, 2.75 and 3.80, when referring to, for example, dose concentrations). Range values are inclusive, unless otherwise stated. For example a range of 1.0 to 5.0 includes 1.0 and 5.0. Unless otherwise stated, all quantities expressed in percent (%) are w/w. The present invention relates to a stent provided with a composition comprising a combination of melatonin and paclitaxel for use in treating SMC proliferation in vascular vessels. Where a particular use of a composition of the present invention is described, said use may be understood as a method. The composition can be used for treating SMC proliferation. This means that the composition can be used to treat a stenosing or restenosing cell mass. The mass may be shrunk or completely eradicated by the composition. It also means the composition can prevent restenosis when applied to regions from which stenosing or restenosing cells have been surgically removed, to reduce the possibility of regrowth. The stent allows treatment of MSC proliferation over a prolonged period. The inventors have found for the first time that the combination of paclitaxel and melatonin acts synergistically against cellular proliferation when locally applied, particularly by way of a stent. The effect of the combination is a significant opening of a lumen narrowed by a stenosing/restenising cell mass, accompanied by reduced injury and inflammation. The effect is greater than could be expected by the mere additive effect of melatonin and paclitaxel. Therefore, administration of the combination of melatonin and paclitaxel to proliferating cells provides an effective treatment against stenosis or restenosis. Thus, in the present invention, paclitaxel is administered to a subject in combination with melatonin, such that a synergistic anti-proliferative effect is produced. The synergistic effect refers to a greater-than-additive effect which is produced by a combination of two drugs, and which exceeds that which would otherwise result from individual administration of either drug alone. Administration of paclitaxel in combination with melatonin unexpectedly results in a synergistic effect by providing greater efficacy than would result from use of either of the agents alone. Melatonin enhances paclitaxel's effects. Therefore, lower doses of one or both of the agents may be used in treating stenosis or restenosis, resulting in increased therapeutic efficacy and decreased side-effects. One measure of synergy between two compounds is the combination index (CI) method of Chou and Talalay [Chou and Talalay, Quantitative analysis of dose-effect relationships: the combined effects of multiple drugs or enzyme inhibitors. Adv. Enzyme Regul., 22:27-55, 1984. ], which is based on the median-effect principle. This method calculates the degree of synergy, additivity, or antagonism between two drugs at various levels of cytotoxicity. Where the CI value is less than 1, there is synergy between the two compounds. Where the CI value is 1, there is an additive effect, but no synergistic effect. CI values greater than 1 indicate antagonism. The smaller the CI value, the greater the synergistic effect. Another measurement of synergy is the fractional inhibitory concentration (FIC) [Hall et al., The fractional inhibitory concentration (FIC) index as a measure of synergy. J. Antimicrob. Chemother., 11(5):427-33, 1983.]. This fractional value is determined by expressing the IC50 of a drug acting in combination, as a function of the IC50 of the drug acting alone. For two interacting drugs, the sum of the FIC value for each drug represents the measure of synergistic interaction. Where the FIC is less than 1, there is synergy between the two drugs. An FIC value of 1 indicates an additive effect. The smaller the FIC value, the greater the synergistic interaction. In the method of the present invention, combination therapy using paclitaxel and melatonin preferably results in an antineoplastic effect that is greater than additive, as determined by any of the measures of synergy known in the art. The term “vessel” as used herein refers to a fluid-carrying duct of a subject suitable for placing a medical stent therein. Such a vessel may be narrowed by a medical condition such as stenosis or atherosclerosis. Examples of vessels include, but are not limited to arteries and veins. A “subject” according to the present invention may be any living body susceptible to treatment by a stent. Examples include, but are not limited to humans, dogs, cats, horses, cows, sheep, rabbits, and goats etc. Where a stent is provided with a composition, it means the composition is deposited on, or within the stent, so the composition can be released when the stent contacts the vessel inner wall. Such stents include drug-releasing stents. The stent may be coated with the composition, Alternatively, the stent may be impregnated with composition, Alternatively, the stent may comprise cavities in which the composition resides. Various embodiments of the stent are described below. A composition as used herein may comprise at least the combination of melatonin and paclitaxel. In the preferred mode of the invention, a stent is provided with the combination of melatonin and paclitaxel, together with a slow release polymer or agent. A composition of the invention may comprise additional substances, such as, for example, those that facilitate solubilization of the melatonin and paclitaxel and/or the attachment of the melatonin and paclitaxel to the stent, those that release the melatonin and paclitaxel in a controlled manner in situ, and those that facilitate the functioning or the performance of the stent in situ. Such additional substances are known to the skilled artisan. Stents according to the invention may be any stent that is capable of being provided with a composition according to the invention. Stents have been extensively described in the art. For example they may be cylinders which are perforated with passages that are slots, ovoid, circular, regular, irregular or the like shape. They may also be composed of helically wound or serpentine wire structures in which the spaces between the wires form the passages. Stents may also be flat perforated structures that are subsequently rolled to form tubular structures or cylindrical structures that are woven, wrapped, drilled, etched or cut to form passages. A stent may also be combined with a graft to form a composite medical device, often referred to as a stent graft. A stent should capable of being coated with a composition described herein. Stents may be made of biocompatible materials including biostable and bioabsorbable materials. Suitable biocompatible metals include, but are not limited to, stainless steel, tantalum, titanium alloys (including nitinol), and cobalt alloys (including cobalt-chromium-nickel alloys). Stents may be made of biocompatible and bioabsorbable materials such as magnesium based alloys. Bioabsorbable stents may inserted at the site of treatment, and left in place. The structure of the stent does not become incorporated into the wall of the vessel being treated, but is degraded with time. Where the stent is made from biostable (non-absorbable) materials, the stent may be inserted for the duration of treatment and later removed. Suitable nonmetallic biocompatible materials include, but are not limited to, polyamides, polyolefins (i.e. polypropylene, polyethylene etc. ), nonabsorbable polyesters (i.e. polyethylene terephthalate), and bioabsorbable aliphatic polyesters (i.e. homopolymers and copolymers of lactic acid, glycolic acid, lactide, glycolide, para-dioxanone, trimethylene carbonate, epsilon-caprolactone, etc. and blends thereof, lactide capronolactone, poly(L-lactide) (PLLA), poly(D,L-lactide) (PLA), polyglycolide (PGA), poly(L-lactide-co-D,L-lactide) (PLLA/PLA), poly(L-lactide-co-glycolide) (PLLA/PGA), poly(D,L-lactide-co-glycolide) (PLA/PGA), poly(glycolide-co-trimethylene carbonate) (PGA/PTMC), polyethylene oxide (PEO), polydioxanone (PDS), polycaprolactone (PCL), polyhydroxylbutyrate (PHBT), poly(phosphazene), polyD,L-lactide-co-caprolactone) (PLA/PCL), poly(glycolide-co-caprolactone) (PGA/PCL), polyanhydrides (PAN), poly(ortho esters), poly(phoshate ester), poly(amino acid), poly(hydroxy butyrate), polyacrylate, polyacrylamid, poly(hydroxyethyl methacrylate), elastin polypeptide co-polymer, polyurethane, starch, polysiloxane and their copolymers. Stents according to the present invention can be of any type known in the art suitable for delivery of the combination of paclitaxel and melatonin. As such these stents can be balloon expandable, self-expanding, provided with cavities etched into the framework of the stent for containing substances, stents provided with means for containing substances, bioabsorbable stents. The stent may also be made from different sorts of wires, for instance from polymeric biodegradable wires containing the active compound, interweaved with the metallic struts of the stent (balloon expendable or self-expandable stent). Self expanding stents may be braided, from flexible metal, such as special alloys, from nitenol, from phynox. Self-expandable stents made from nitenol may be laser cut. One or more of the filaments that compose the self-expandable stent can be made from a polymer or a tube that elutes the anti-energetic compound. Variations of stent and polymers are described in more detailed below. Examples of stents include, but are not limited to, those described in U.S. Pat. No. 4,733,665, U.S. Pat. No. 4,800,882, U.S. Pat. No. 4,886,062, U.S. Pat. No. 5,514,154, U.S. Pat. No. 6,398,806, EP 1 140 242, U.S. Pat. No. 6,248,129, EP 1 217 969, EP 1 359 868, EP 1 349 517, EP 1 347 717, EP 1 318 765, EP 1 296 615, EP 1 229 864, EP 1 194 081, EP 1 191 904, EP 1 139 914, EP 1 087 701, EP 1 079 768, EP 1 018 985, EP 0 749 729, EP 0 556 850, EP 1 328 212, EP 1 322 256, EP 0 740 558, EP 1 251 800, EP 1 251 799, EP 1 235 856, EP 1 227 772, EP 1 123 065, EP 1 112 040, EP 1 094 764, EP 1 076 534, EP 1 065 993, EP 1 059 896, EP 1 059 894, EP 1 049 421, EP 1 027 012, EP 1 001 718, EP 0 986 416, EP 0 859 644, EP 0 740 558, EP 0 664 689, EP 0 556 850, EP 1 372 535, U.S. Pat. No. 6,669,723, U.S. Pat. No. 6,663,660, EP 1 065 996, U.S. Pat. No. 6,652,577, U.S. Pat. No. 6,652,575, EP 1 360 943, U.S. Pat. No. 6,620,202, U.S. Pat. No. 6,610,087, U.S. Pat. No. 6,602,283, U.S. Pat. No. 6,592,617, U.S. Pat. No. 6, 585,758, U.S. Pat. No. 6,585,753, EP 1 318 771, EP 1 318 768, U.S. Pat. No. 6,579,308, US 2003/0109931, EP 1 163 889, EP 0 790 811, U.S. Pat. No. 6,551,351, U.S. Pat. No. 6,540,777, U.S. Pat. No. 6,533,810, U.S. Pat. No. 6,530,950, U.S. Pat. No. 6,527,802, U.S. Pat. No. 6,524,334, U.S. Pat. No. 6,506,211, U.S. Pat. No. 6,488,703, U.S. Pat. No. 6,485,590, U.S. Pat. No. 6,478,816, U.S. Pat. No. 6,478,815, U.S. Pat. No. 6,475,233, EP 1 251 891, U.S. Pat. No. 6,471,720, U.S. Pat. No. 6,428,569, EP 1 223 873, EP 0 758 216, U.S. Pat. No. 6,416,543, U.S. Pat. No. 6,641,538, EP 1 217 101, U.S. Pat. No. 6,409,754, U.S. Pat. No. 6,409,753, US 2002/0077592, EP 0 754 017, U.S. Pat. No. 6,398,807, EP 1 207 815, EP 0 775 471, U.S. Pat. No. 6,395,020, IS 6,391,052, U.S. Pat. No. 6,387,122, U.S. Pat. No. 6,379,379, U.S. Pat No. 6,355,070, U.S. Pat. No. 6,348,065, EP 1 173 110, U.S. Pat. No. 6,334,870, EP 1 163 889, IS 6,325,822, U.S. Pat. No. 6,319,277, EP 1 144 042, EP 0 622 059, U.S. Pat. No. 6,261,319, EP 1 112 039, U.S. Pat. No. 6,251,134, U.S. Pat. No. 6,240,978, U.S. Pat. No. 6,217,607, U.S. Pat. No. 6,193,744, U.S. Pat. No. 6,174,328, EP 1 065 996, U.S. Pat. No. 6,168,621, U.S. Pat. No. 6,168,619, U.S. Pat. No. 6,159,238, U.S. Pat. No. 6,159,237, U.S. Pat. No. 6,146,416, U.S. Pat. No. 6,143,002, EP 0 986 416, EP 1 032 329, EP 1 019 107, EP 1 011 529, EP 1 011 528, U.S. Pat. No. 6,071,308, EP 0 859 644, U.S. Pat. No. 6,059,810, U.S. Pat. No. 6,042,597, U.S. Pat. No. 6,033,433, EP 0 979 059, U.S. Pat. No. 6,022,371, U.S. Pat. No. 5,993,483, U.S. Pat. No. 6,957,974, U.S. Pat. No. 5,594,744, WO 99/44535, EP 0 934 034, EP 0 934 033, U.S. Pat. No. 5,922,019, WO 99/16388, EP 0 858 298, U.S. Pat. No. 5,891,191, U.S. Pat. No. 5,888,201, U.S. Pat. No. 5,876,448, U.S. Pat. No. 5,876,445, U.S. Pat. No. 5,868,781, U.S. Pat. No. 5,855,600, WO 98/55174, EP 0 746 375, U.S. Pat. No. 5,824,045, U.S. Pat. No. 5,800,511, EP 0 836 839, EP 0 767 685, U.S. Pat. No. 5,683,488, EP 1 212 987, EP 1 212 987, EP 1 151 730, EP 1 151 730, EP 0 722 701, EP 1 236 447, EP 1 293 178, EP 1 236 449, EP 1 190 685, EP 1 138 280, EP 1 346 706, EP 1 330 993, EP 1 258 231, EP 1 325 717, EP 1 302 179, EP 1 095 634, EP 1 302 179, EP 1 295 615, EP 1 293 178, EP 1 266 638, EP 1 266 638, EP 1 260 197, EP 1 236 448, EP 1 236 446, EP 1 236 445, EP 1 258 231, EP 1 236 449, EP 1 236 448, EP 1 236 447, EP 1 236 446, EP 1 236 445, EP 1 112 724, EP 1 190 685, EP 1 179 323, EP 1 138 280, EP 1 112 724, EP 1 031 330, EP 0 937 442, EP 1 042 997, EP 1 031 330, EP 1 025 812, EP 1 000 590, EP 0 950 386, EP 0 873 734, EP 0 937 442, EP 0 864 302, EP 0 928 606, EP 0 864 302, EP 0 806 191, EP 1 212 988, EP 1 266 640, EP 1 266 639, EP 0 879 027, EP 1 226 798, U.S. Pat. No. 6,656,215, EP 1 362 564, EP 0 904 009, EP 1 212 990, EP 1 155 664, EP 1 121 911, EP 1 266 640, EP 1 266 639, EP 1 031 329, EP 1 212 990, EP 1 212 988, EP 0 698 380, EP 1 155 664, EP 1 121 911, U.S. Pat. No. 6,270,521, EP 1 031 329, EP 0 928 605, EP 0 928 605, EP 0 904 009, EP 0 903 123, EP 0 879 027, U.S. Pat. No. 5,840,009, EP 0 839 506, U.S. Pat. No. 5,741,324, EP 0 823 245, EP 0 698 380, EP 0 606 165, U.S. Pat. No. 6,626,938, U.S. Pat. No. 6,613,075, U.S. Pat. No. 6,565,600, U.S. Pat. No. 6,562,067, U.S. Pat. No. 6,547,817, U.S. Pat. No. 6,540,775, U.S. Pat. No. 6,520,985, U.S. Pat. No. 6,494,908, U.S. Pat. No. 6,482,227, U.S. Pat. No. 6,423,091, U.S. Pat. No. 6,342,067, U.S. Pat. No. 6,325,825, U.S. Pat. No. 6,315,708, U.S. Pat. No. 6,267,783, U.S. Pat. No. 6,267,777, U.S. Pat. No. 6,264,687, U.S. Pat. No. 6,258,116, U.S. Pat. No. 6,238,409, U.S. Pat. No. 6,214,036, U.S. Pat. No. 6,190,406, U.S. Pat. No. 6,176,872, U.S. Pat. No. 6,162,243, U.S. Pat. No. 6,129,755, U.S. Pat. No. 6,053,873, EP 0 904 009, U.S. Pat. No. 6,019,778, EP 0 974 315, U.S. Pat. No. 6,017,363, EP 0 951 877, EP 0 970 711, EP 0 785 807, U.S. Pat. No. 6,013,019, EP 0 947 180, U.S. Pat. No. 5,997,570, U.S. Pat. No. 5,980,553, EP 0 951 877, U.S. Pat. No. 5,938,682, U.S. Pat. No. 5,895,406, U.S. Pat. No. 5,891,108, U.S. Pat. No. 5,882,335, U.S. Pat. No. 5,792,172, U.S. Pat. No. 5,782,906, EP 0 810 845, U.S. Pat. No. 5,695,516, U.S. Pat. No. 5,674,241, U.S. Pat. No. 5,609,605, U.S. Pat. No. 5,607,442, U.S. Pat. No. 5,599,291, U.S. Pat. No. 5,135,536, U.S. Pat. No. 5,116,365, EP 0 378 151, U.S. Pat. No. 4,994,071, EP 0 378 151, U.S. Pat. No. 4,856,516. The content of all documents referred to in this application are incorporated herein by reference. It is an aspect of the invention that the stent is provided with a combination of paclitaxel and melatonin by way of at least partially coating the stent with a composition comprising a polymer, paclitaxel and melatonin. A polymer according to the present invention is any that facilitates attachment of the paclitaxel and melatonin to the stent (i.e. stent and/or membrane) and/or facilitates the controlled release of paclitaxel and melatonin. Polymers suitable for use in the present invention are any that are capable of attaching to the stent and releasing paclitaxel and melatonin. They must be biocompatible to minimize irritation to the vessel wall. Polymers may be, for example, film-forming polymers that are absorbable or non-absorbable. The polymer may be biostable or bioabsorbable depending on the desired rate of release or the desired degree of polymer stability. Suitable bioabsorbable polymers that could be used include polymers selected from the group consisting of aliphatic polyesters, poly(amino acids), copoly(ether-esters), polyalkylenes oxalates, polyamides, poly(iminocarbonates), polyanhydrides, polyorthoesters, polyoxaesters, polyamidoesters, polylactic acid (PLA), polyethylene oxide (PEO), polycaprolactone (PCL), polyhydroxybutyrate valerates, polyoxaesters containing amido groups, poly(anhydrides), polyphosphazenes, silicones, hydrogels, biomolecules and blends thereof. Another polymer is any poly(ester amide). For the purpose of the present invention, aliphatic polyesters include homopolymers and copolymers of lactide (which includes lactic acid D-, L- and meso lactide), epsilon—caprolactone, glycolide (including glycolic acid), hydroxybutyrate, hydroxyvalerate, para-dioxanone, trimethylene carbonate (and its alkyl derivatives), 1,4-dioxepan-2-one, 1,5-dioxepan-2-one, 6,6-dimethyl-1,4-dioxan-2-one and polymer blends thereof. Poly(iminocarbonate) for the purpose of this invention include as described by Kemnitzer and Kohn, in the Handbook of Biodegradable Polymers, edited by Domb, Kost and Wisemen, Hardwood Academic Press, 1997, pages 251-272. Copoly(ether-esters) for the purpose of this invention include those copolyester-ethers described in Journal of Biomaterials Research, Vol. 22, pages 993-1009, 1988 by Cohn and Younes and Cohn, Polymer Preprints (ACS Division of Polymer Chemistry) Vol. 30(1), page 498, 1989 (e.g. PEO/PLA). Polyalkylene oxalates for the purpose of this invention include U.S. Pat. Nos. 4,208,511; 4,141,087; 4,130,639; 4,140,678; 4,105,034; and 4,205,399 (incorporated by reference herein). Polyphosphazenes, co-, ter- and higher order mixed monomer based polymers made from L-lactide, D,L-lactide, lactic acid, glycolide, glycolic acid, para-dioxanone, trimethylene carbonate and epsilon -caprolactone such as are described by Allcock in The Encyclopedia of Polymer Science, Vol. 13, pages 31-41, Wiley Intersciences, John Wiley & Sons, 1988 and by Vandorpe, Schacht, Dejardin and Lemmouchi in the Handbook of Biodegradable Polymers, edited by Domb, Kost and Wisemen, Hardwood Academic Press, 1997, pages 161-182 (which are hereby incorporated by reference herein). Polyanhydrides from diacids of the form HOOC—C6H4—O—(CH2)m-O—C6H4—COOH wherein m is an integer in the range of from 1 to 11, 3 to 9, 3 to 7, 2 to 6 or preferably 2 to 8, and copolymers thereof with aliphatic alpha-omega diacids of up to 8, 9, 10, 11 or preferably 12 carbons. Polyoxaesters polyoxaamides and polyoxaesters containing amines and/or amido groups are described in one or more of the following U.S. Pat. Nos. 5,464,929; 5,595,751; 5,597,579; 5,607,687; 5,618,552; 5,620,698; 5,645,850; 5,648,088; 5,698,213 and 5,700,583; (which are incorporated herein by reference). Polyorthoesters such as those described by Heller in Handbook of Biodegradable Polymers, edited by Domb, Kost and Wisemen, Hardwood Academic Press, 1997, pages 99-118 (hereby incorporated herein by reference). Other polymeric biomolecules for the purpose of this invention include naturally occurring materials that may be enzymatically degraded in the human body or are hydrolytically unstable in the human body such as fibrin, fibrinogen, collagen, gelatin, glycosaminoglycans, elastin, and absorbable biocompatible polysaccharides such as chitosan, starch, fatty acids (and esters thereof), glucoso-glycans and hyaluronic acid. y is an integer in the range of from 3 to 18, 5 to 14, 6 to 10 or preferably 4 to 16. The list provided above is illustrative but not limiting. Other polymers suitable for use in the present invention are bioabsorbable elastomers, more preferably aliphatic polyester elastomers. In the proper proportions aliphatic polyester copolymers are elastomers. Elastomers present the advantage that they tend to adhere well to the metal stents and can withstand significant deformation without cracking. The high elongation and good adhesion provide superior performance to other polymer coatings when the coated stent is expanded. Examples of suitable bioabsorbable elastomers are described in U.S. Pat. No. 5,468,253 hereby incorporated by reference. Preferably the bioabsorbable biocompatible elastomers based on aliphatic polyester, including but not limited to those selected from the group consisting of elastomeric copolymers of epsilon-caprolactone and glycolide (preferably having a mole ratio of epsilon-caprolactone to glycolide of from about 35:65 to about 65:35, more preferably 45:55 to 35:65) elastomeric copolymers of E-caprolactone and lactide, including L-lactide, D-lactide blends thereof or lactic acid copolymers (preferably having a mole ratio of epsilon-caprolactone to lactide of from about 35:65 to about 90:10 and more preferably from about 35:65 to about 65:35 and most preferably from about 45:55 to 30:70 or from about 90:10 to about 80:20) elastomeric copolymers of p-dioxanone (1,4-dioxan-2-one) and lactide including L-lactide, D-lactide and lactic acid (preferably having a mole ratio of p-dioxanone to lactide of from about 30:70 to about 70:30, 45:55 to about 55:45, and preferably from about 40:60 to about 60:40) elastomeric copolymers of epsilon-caprolactone and p-dioxanone (preferably having a mole ratio of epsilon-caprolactone to p-dioxanone of from about 40:60 to about 60:40 and preferably from about 30:70 to about 70:30) elastomeric copolymers of p-dioxanone and trimethylene carbonate (preferably having a mole ratio of p-dioxanone to trimethylene carbonate of from about 40:60 to about 60:40, and preferably from about 30:70 to about 70:30), elastomeric copolymers of trimethylene carbonate and glycolide (preferably having a mole ratio of trimethylene carbonate to glycolide of from about 40:60 to about 60:40 and preferably from about 30:70 to about 70:30), elastomeric copolymer of trimethylene carbonate and lactide including L-lactide, D-lactide, blends thereof or lactic acid copolymers (preferably having a mole ratio of trimethylene carbonate to lactide of from about 30:70 to about 70:30) and blends thereof. As is well known in the art these aliphatic polyester copolymers have different hydrolysis rates, therefore, the choice of elastomer may in part be based on the requirements for the coatings adsorption. For example epsilon-caprolactone-co-glycolide copolymer (45:55 mole percent, respectively) films lose 90% of their initial strength after 2 weeks in simulated physiological buffer whereas the epsilon-caprolactone-co-lactide copolymers (40:60 mole percent, respectively) loses all of its strength between 12 and 16 weeks in the same buffer. Mixtures of the fast hydrolyzing and slow hydrolyzing polymers can be used to adjust the time of strength retention. The amount of coating may range from about 0.5 to about 20 as a percent of the total weight of the stent after coating and preferably will range from about 1 to about 15 percent. The polymer coatings may be applied in one or more coating steps depending on the amount of polymer to be applied. Different polymers may also be used for different layers in the stent coating. In fact it may be an option to use a dilute first coating solution as primer to promote adhesion of a subsequent coating layers that may contain paclitaxel and melatohin. Additionally, a top coating can be applied to further delay release of paclitaxel and melatonin, or they could be used as the matrix for the delivery of a different pharmaceutically active material. The amount of top coatings on the stent may vary, but will generally be less than about 2000 micrograms, preferably the amount of top coating will be in the range of about micrograms to about 1700 micrograms and most preferably in the range of from about 300 micrograms to 1000 about micrograms. Layering of coating of fast and slow hydrolyzing copolymers can be used to stage release of the drug or to control release of different agents placed in different layers. Polymer blends may also be used to control the release rate of different agents or to provide desirable balance of coating (i.e. elasticity, toughness etc.) and drug delivery characteristics (release profile). Polymers with different solubilities in solvents can be used to build up different polymer layers that may be used to deliver different drugs or control the release profile of a drug. For example since epsilon-caprolactone-co-lactide elastomers are soluble in ethyl acetate and epsilon-caprolactone-co-glycolide elastomers are not soluble in ethyl acetate. A first layer of epsilon-caprolactone-co-glycolide elastomer containing a drug can be over coated with epsilon-caprolactone-co-glycolide elastomer using a coating solution made with ethyl acetate as the solvent. Additionally, different monomer ratios within a copolymer, polymer structure or molecular weights may result in different solubilities. For example, 45/55 epsilon-caprolactone-co-glycolide at room temperature is soluble in acetone whereas a similar molecular weight copolymer of 35/65 epsilon-caprolactone-co-glycolide is substantially insoluble within a 4 weight percent solution. The second coating (or multiple additional coatings) can be used as a top coating to delay the drug delivery of the drug contained in the first layer. Alternatively, the second layer could contain either paclitaxel or melatonin to provide for sequential delivery. Multiple layers of could be provided by alternating layers of first one polymer then the other. As will be readily appreciated by those skilled in the art numerous layering approaches can be used to provide the desired drug delivery. The coatings can be applied by suitable methodology known to the skilled person, such as, for example, dip coating, spray coating, electrostatic coating, melting a powered form onto the stent. The coating may also be applied during the intervention by the interventional cardiologist on a bare stent. As some polymers (for instance polyorthoesters) need special conservation conditions (argon atmosphere and cold temperature), the drug with the coating may be delivered in a special packing. The MD would apply the coating on the bare stent surface—as it is slightly sticky—just before introducing the premounted stent inside the patient vessel. Other examples of polymeric coatings, and coating methods are given in patent documents EP 1 107 707, WO 97/10011, U.S. Pat. No. 6,656,156, EP 0 822 788, U.S. Pat. No. 6,364,903, U.S. Pat. No. 6,231,600, U.S. Pat. No. 5,837,313, WO 96/32907, EP 0 832,655, U.S. Pat. No. 6,653,426, U.S. Pat. No. 6,569,195, EP 0 822 788 B1, WO 00/32238, U.S. Pat. No. 6,258,121, EP 0 832,665, WO 01/37892, U.S. Pat. No. 6,585,764, U.S. Pat. No. 6,153,252 which are incorporated herein by reference. Another aspect of the invention is a stent coated with a composition of the invention, wherein the presence of a polymer is optional. Such stents suited to polymeric and non-polymeric coatings and compositions are known in the art. These stents may, for example, have a rough surface, microscopic pits or be constructed from a porous material. Examples include, but are not limited to the disclosures of U.S. Pat. No. 6,387,121, U.S. Pat. No. 5,972,027, U.S. Pat. No. 6,273,913 and U.S. Pat. No. 6,099,561. These documents are incorporated herein by reference. A stent may also be combined with a graft to form a composite medical device, often referred to as a stent graft. Such a composite medical device provides additional support for blood flow through weakened sections of a blood vessel. The graft element made be formed from any suitable material such as, for example, textiles such as nylon, Orlon, Dacron, or woven Teflon, and nontextiles such as expanded polytetrafluroethylene (ePTFE). Stent grafts of the present invention may be coated with, or otherwise adapted to release the paclitaxel and melatonin of the present invention. Stent grafts may be adapted to release paclitaxel and melatonin by (a) directly affixing to the stent graft a composition according to the invention (e.g., by either spraying the stent graft with a polymer/paclitaxel/melatonin film, or by dipping the implant or device into a polymer/drug solution, or by other covalent or noncovalent means); (b) by coating the stent graft with a substance such as a hydrogel which will in turn absorb a composition according to the invention; (c) by interweaving a composition coated thread into the stent graft (e.g., a polymer which releases the paclitaxel and melatonin formed into a thread into the implant or device; (d) by inserting a sleeve or mesh which is comprised of or coated with a composition according to the present invention; (e) constructing the stent graft itself a composition according to the invention; or (f) otherwise impregnating the stent graft with a composition according to the invention. The stent graft may be biodegradable, made from, but not limited to, magnesium alloy and starch. Examples and methods of stent graft coating are provided in patent documents WO 00/40278, and WO 00/56247. These documents are incorporated herein by reference. It is an aspect of the invention that the stent is provided with a composition of the invention which is present in a cavity formed in the stent. Stent in which cavities are present suitable for the delivery of biologically active material are known in the art, for example, from WO 02/060351 U.S. Pat. No. 6,071,305, U.S. Pat. No. 5,891,108. These documents are incorporated herein by reference. Another aspect of the invention is a biodegradable (bioabsorbable) stent impregnated with a composition according to the present invention. The composition may be coated onto the stent or impregnated into the stent structure, said composition released in situ concomitant with the biodegradation of the stent. Suitable materials for the main body of the stent includes, but are not limited to poly(alpha-hydroxy acid) such as poly-L-lactide (PLLA), poly-D-lactide (PDLA), polyglycolide (PGA), polydioxanone, polycaprolactone, polygluconate, polylactic acid-polyethylene oxide copolymers, modified cellulose, collagen or other connective proteins or natural materials, poly(hydroxybutyrate), polyanhydride, polyphosphoester, poly(amino acids), hylauric acid, starch, chitosan, adhesive proteins, co-polymers of these materials as well as composites and combinations thereof and combinations of other biodegradable polymers. Biodegradable glass or bioactive glass is also a suitable biodegradable material for use in the present invention. A composition of the present invention may be incorporated into a biodegradable stent using known methods. Examples of biodegradable stents known in the art, include, but are not limited to the those disclosed in US 2002/0099434, U.S. Pat. No. 6,387,124 B1, U.S. Pat. No. 5,769,883, EP 0 894 505 A2, U.S. Pat. No. 653,312, U.S. Pat. No. 6,423,092, U.S. Pat. No. 6,338,739 and U.S. Pat. No. 6,245,103, EP 1 110 561. These documents are incorporated here by reference. Biodegradable stents may also be made from a metal (lanthanide such as, but not limited to magnesium or magnesium alloy), or an association of organic and non-organic material (such as, but not limited to a magnesium based alloy combined with starch). Another aspect of the invention relates to a composition comprising additives which control release of paclitaxel and melatonin. According to another embodiment of the invention, the composition is a slow release formulation. Accordingly, the stent may be provided with a large or concentrated dose of paclitaxel and melatonin. Once the stent is at the site of treatment, paclitaxel and melatonin are released at a rate determined by the formulation. This avoids the need for frequently replacing stents to maintain a particular dose. Another advantage of a slow release formulation is that the composition diffuses day and night, over several days or weeks. One embodiment of the present invention is a stent comprising a composition as described herein, wherein said composition further comprises one or more slow release agents. Slow release agents may be natural or synthetic polymers, or reabsorbable systems such as magnesium alloys. Among the synthetic polymers useful according to a slow release formulation of the invention are poly(glycolic) acid, poly(lactic acid) or in general glycolic- and lactic acid based polymers and copolymers. They also include poly caprolactones and in general, poly hydroxyl alkanoates (PHAs) (poly(hydroxy alcanoic acids)=all polyester). They also include Poly(ethylene glycol), poly vinyl alcohol, poly(orthoesters), poly(anhydrides), poly(carbonates), poly amides, poly imides, poly imines, poly(imino carbonates), poly(ethylene imines), polydioxanes, poly oxyethylene(poly ethylene oxide), poly(phosphazenes), poly sulphones, lipids, poly acrylic acids, poly methylmethacrylate (PMMA), poly acryl amides, poly ester amides, poly acrylo nitriles(Poly cyano acrylates), poly HEMA, poly urethanes, poly olefins, poly styrene, poly terephthalates, poly ethylenes, poly propylenes, poly ether ketones, poly vinylchlorides, poly fluorides, silicones, poly silicates (bioactive glass), siloxanes(Poly dimethyl siloxanes), hydroxyapatites, lactide-capronolactone, and any other synthetic polymer known to a person skilled in the art. Other synthetic polymers may be made from hydrogels based on activated polyethyleneglycols (PEGs) combined with alkaline hydrolyzed animal or vegetal proteins. Among the natural derived polymers useful according to a slow release formulation of the invention, are poly aminoacids (natural and non natural), poly β-aminoesters. They also include poly(peptides) such as: albumins, alginates, cellulose/cellulose acetates, chitin/chitosan, collagen, fibrin/fibrinogen, gelatin, lignin. In general, protein based polymers. Poly(lysine), poly(glutamate), poly(malonates), poly(hyaluronic acids). Poly nucleic acids, poly saccharides, poly(hydroxyalkanoates), poly isoprenoids, starch based polymers, and any other natural derived polymer known to a person skilled in the art. Other polymers may be made from hydrogels based on activated polyethyleneglycols (PEGs) combined with alkaline hydrolyzed animal or vegetal proteins. For both synthetic and natural polymers, the invention includes copolymers thereof are included as well, such as linear, branched, hyperbranched, dendrimers, crosslinked, functionalized (surface, functional groups, hydrophilic/hydrophobic). Blood, cell and tissue compatibility: in vitro, pre-clinical and clinical studies have demonstrated the biocompatibility of PEAs. Preferred PEA compositions include, but are not restricted to; PEA 8LD60% Tempo; PEA 4LD33% Tempo; PEA Ac Tempo; PEA Ac Bz and PEA GJ-2-2. The slow release composition may be formulated as liquids or semi-liquids, such as solutions, gels, hydrogels, suspensions, lattices, liposomes. Any suitable formulation known to the skilled man is within the scope the scope of the invention. According to an aspect of the invention, a composition is formulated such that the quantity of melatonin is between less than 1% and 60% of total slow-release polymer mass. According to an aspect of the invention, a composition is formulated such that the quantity of melatonin is between 1% and 50%, 1% and 40%, 1% and 30%, 1% and 20%, 2% and 60%, 5% and 60%, 10% and 60%, 20% and 60%, 30% and 60%, or 40% and 60% of total slow-release polymer mass. According to an aspect of the invention, a composition is formulated such that the quantity of paclitaxel is between less than 1% and 60% of total slow-release polymer mass. According to an aspect of the invention, a composition is formulated such that the quantity of paclitaxel is between 1% and 50%, 1% and 40%, 1% and 30%, 1% and 20%, 2% and 60%, 5% and 60%, 10% and 60%, 20% and 60%, 30% and 60%, or 40% and 60% of total slow-release polymer mass. As mentioned above, SMC proliferation such as stenosis, restenosis and its prevention are susceptible to treatment by a stent according to the present invention. A stent may be placed on or adjacent to the proliferating SMCs, for example, in a vessel such as an artery. The stent of the present invention may be used to prevent or treat stenosis or restenosis in a subject in need of treatment. The stent may also be placed in situ after the removal of proliferating SMCs. For example, after surgical removal of a stenosis in an artery, a stent may be placed in the area of the artery suture to shrink proliferating cells possibly remaining after surgery. The paclitaxel and melatonin combination may be combined with a slow release agent so that they can act over a period of days to weeks, so avoiding replacement of the stent. Where a biodegradable stent is used, the stent does not need to be removed after treatment. The present invention is useful for treating any animal in need including humans, livestock, domestic animals, wild animals, or any animal in need of treatment. Examples of an animal is human, horse, cat, dog, mice, rat, gerbil, bovine species, pig, fowl, camelidae species, goat, sheep, rabbit, hare, bird, elephant, monkey, chimpanzee etc. An animal may be a mammal. Paclitaxel refers to paclitaxel, analogues and derivatives thereof, including, for example, a natural or synthetic functional analogue of paclitaxel which has paclitaxel biological activity, as well as a fragment of paclitaxel having paclitaxel biological activity. Paclitaxel includes the compound having formula (I). A compound which is a paclitaxel analogue refers to a compound which interferes with cellular mitosis by affecting microtubule formation and/or action, thereby producing antimitotic and anti-cellular proliferation effects. Methods of preparing paclitaxel and its analogues and derivatives are well-known in the art, and are described, for example, in U.S. Pat. Nos. 5,569,729; 5,565,478; 5,530,020; 5,527,924; 5,484,809; 5,475,120; 5,440,057; and 5,296,506. Paclitaxel and its analogues and derivatives are also available commercially. Synthetic paclitaxel, for example, can be obtained from Bristol-Myers Squibb Company, Oncology Division (Princeton, N.J.), under the registered trademark Taxol®. An analogue of paclitaxel may have a structure according to formula II, whereby paclitaxel is modified at the C10 position. R may be any of Propionyl, Isobutyryl, Valeryl, Hexanoyl, Octanoyl, Decanoyl, Tridecanoyl, Methoxyacetyl, Methylthioacetyl, Methylsulfonylacetyl Acetoxyacetyl, Ethylformyl, Monosuccinyl, Crotonoyl, Acryloyl, Cyclopropanecarbonyl Cyclobutanecarbonyl, Cyclopentanecarbonyl, Cyclohexanecarbonyl, Hydrocinnamoyl, trans-Cinnamoyl, Phenylacetyl, Diphenylacetyl, Benzoyl 2-Chlorobenzoyl, 3-Chlorobenzoyl, 4-Chlorobenzoyl, 3,4-Dichlorobenzoyl, 3,5-Dichlorobenzoyl, 2,4-Dichlorobenzoyl, 3,5-Dibromobenzoyl, 4-Fluorobenzoyl, 3-Trifluoromethylbenzoyl, 4-Trifluoromethylbenzoyl, 3-Nitrobenzoyl, 4-Nitrobenzoyl, 3-Dimethylaminobenzoyl, 3-Methoxybenzoyl, 1-Naphthoyl, 2-Naphthoyl, 2-Quinolinecarbonyl, 3-Quinolinecarbonyl, 4-Quinolinecarbonyl, Indole-3-acetyl, Pyrrole-2-carbonyl, 1-Methyl-2-pyrrolecarbonyl, 2-Furoyl, 5-Bromofuroyl, 5-Nitrofuroyl, 3-Thiophenecarbonyl, 2-Thiophenecarbonyl, 2-Thiopheneacetyl, Picolinoyl, Isonicotinoyl, 5,6-Dichloronicotinoyl, 2-Methylnicotinoyl, 6-Methyinicotinoyl, 5-Bromonicotinoyl, 2-Pyrazinecarbonyl, Isobutyryl, Valeryl, Methoxyacetyl or Cyclohexanecarbonyl. Methods for the preparation of said analogues are described fully in Liu et al, Combinatorial chemistry and High Throughput Screening, 2002, Vol 5, p 39 to 48. Taxol® and its analogues and derivatives have been used successfully to treat leukemias and tumors. In particular, Taxol® is useful in the treatment of breast, lung, and ovarian cancers. Moreover, paclitaxel may be synthesized in accordance with known organic chemistry procedures (Nerenberg et al., Total synthesis of the immunosuppressive agent (−)-discodermolide. J. Amer. Chem. Soc., 115:12,621-12,622, 1993) that are readily understood by one skilled in the art. Melatonin (N-acetyl-5-methoxytryptamine) is a hormone secreted by the pineal gland. Melatonin is often prescribed for the treatment of sleep disturbances and jet-lag. The pharmacological activity of melatonin has been described in numerous publications. One of the early investigations of the pharmacological activity of melatonin was by Barchas and coworkers (Barchas et al. Nature 1967, 214, 919). Melatonin refers to melatonin, analogues and derivatives thereof. An analogue of melatonin is a natural or synthetic functional variant of melatonin which has melatonin biological activity. 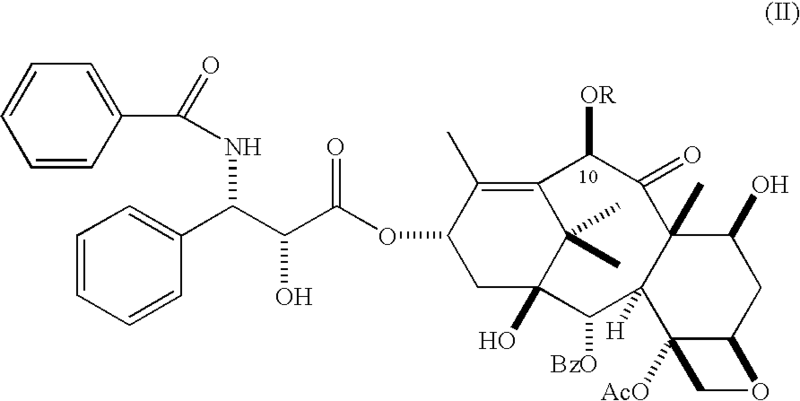 An analogue of melatonin can be a compound which binds to the melatonin receptor; methods for identifying such melatonin analogues, for example by standard screening techniques, are well known in the art. An analogue may be a compound that binds to the melatonin receptor with an affinity better than 10−6M in suitable buffer conditions. 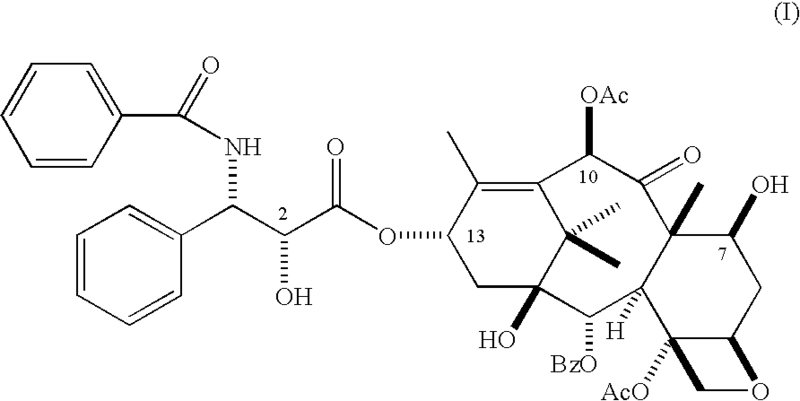 Melatonin includes the compound having formula (III). Examples of analogues of melatonin include 2-iodomelatonin, 6-chloromelatonin, 6,7-dichloro-2-methylmelatonin and 8-hydroxymelatonin, all of which contain the 5-methoxy indole ring as an essential moiety (Dubocovich, et al. Proc. Nat'l. Acad. Sci. (USA) 1987, 84, 3916-3918; Dubocovich, M; J. Pharmacol. Exp. Ther: 1985,234,395; Dubocovich, M. L. Trends Pharmacol. Sci. 1995, 16, 50-56). According to one aspect the invention, the paclitaxel comprises one or more analogues of paclitaxel optionally in combination with paclitaxel. According to another aspect the invention, the melatonin comprises one or more analogues of melatonin optionally in combination with melatonin. Owing to the properties of proliferating SMCs, the inventors find that a composition comprising combinations of analogues may also be effective at reducing a proliferating cell mass. Stereoisomer, tautomers, racemates, prod rugs, metabolites, pharmaceutically acceptable salts, bases, esters, structurally related compounds or solvates of palitaxel or melatonin are within the scope of the invention, unless otherwise stated. The pharmaceutically acceptable salts of palitaxel or melatonin according to the invention, i.e. in the form of water-, oil-soluble, or dispersible products, include the conventional non-toxic salts or the quaternary ammonium salts which are formed, e.g., from inorganic or organic acids or bases. Examples of such acid addition salts include acetate, adipate, alginate, aspartate, benzoate, benzenesulfonate, bisulfate, butyrate, citrate, camphorate, camphorsulfonate, cyclopentanepropionate, digluconate, dodecylsulfate, ethanesulfonate, fumarate, glucoheptanoate, glycerophosphate, hemisulfate, heptanoate, hexanoate, hydrochloride, hydrobromide, hydroiodide, 2-hydroxyethanesulfonate, lactate, maleate, methanesulfonate, 2-naphthalenesulfonate, nicotinate, oxalate, pamoate, pectinate, persulfate, 3-phenylpropionate, picrate, pivalate, propionate, succinate, tartrate, thiocyanate, tosylate, and undecanoate. Base salts include ammonium salts, alkali metal salts such as sodium and potassium salts, alkaline earth metal salts such as calcium and magnesium salts, salts with organic bases such as dicyclohexylamine salts, N-methyl-D-glucamine, and salts with amino acids such a sarginine, lysine, and so forth. Also, the basic nitrogen-containing groups may be quaternized with such agents as lower alkyl halides, such as methyl, ethyl, propyl, and butyl chloride, bromides and iodides; dialkyl sulfates like dimethyl, diethyl, dibutyl; and diamyl sulfates, long chain halides such as decyl, lauryl, myristyl and stearyl chlorides, bromides and iodides, aralkyl halides like benzyl and phenethyl-bromides and others. Other pharmaceutically acceptable salts include the sulfate salt ethanolate and sulfate salts. The term “stereoisomer”, as used herein, defines all possible compounds made up of the same atoms bonded by the same sequence of bonds but having different three-dimensional structures which are not interchangeable, which palitaxel or melatonin may possess. Unless otherwise mentioned or indicated, the chemical designation of palitaxel or melatonin herein encompasses the mixture of all possible stereochemically isomeric forms, which said compound may possess. Said mixture may contain all diastereomers and/or enantiomers of the basic molecular structure of said compound. All stereochemically isomeric forms of palitaxel or melatonin either in pure form or in admixture with each other are intended to fall within the scope of the present invention. Palitaxel or melatonin may also exist in their tautomeric forms. Such forms, although not explicitly indicated in the compounds described herein, are intended to be included within the scope of the present invention. For therapeutic use, the salts of palitaxel or melatonin according to the invention are those wherein the counter-ion is pharmaceutically or physiologically acceptable. The term “pro-drug” as used herein means the pharmacologically acceptable derivatives such as esters, amides and phosphates, such that the resulting in vivo biotransformation product of the derivative is the active drug. The reference by Goodman and Gilman (The Pharmacological Basis of Therapeutics, 8th Ed, McGraw-Hill, Int. Ed. 1992, “Biotransformation of Drugs”, p 13-15) describing pro-drugs generally is hereby incorporated. Pro-drugs of the compounds of the invention can be prepared by modifying functional groups present in said component in such a way that the modifications are cleaved, either in routine manipulation or in vivo, to the parent component. Typical examples of pro-drugs are described for instance in WO 99/33795, WO 99/33815, WO 99/33793 and WO 99/33792 all incorporated herein by reference. Pro-drugs are characterized by increased bio-availability and are readily metabolized into the active palitaxel or melatonin in vivo. The melatonin and paclitaxel on a stent is preferably present in an amount to inhibit proliferation of smooth muscle cells. It is preferably present in an amount to prevent or treat stenosis or restenosis. An amount of melatonin and paclitaxel that is effective to prevent or treat stenosis or restenosis is an amount that is effective to ameliorate or minimize the clinical impairment or symptoms of the stenosis or restenosis. For example, the clinical impairment or symptoms of stenosis or restenosis may be ameliorated or minimized by diminishing any pain or discomfort suffered by the subject; by extending the survival of the subject beyond that which would otherwise be expected in the absence of such treatment; by inhibiting or preventing the development or spread of stenosis or restenosis; or by limiting, suspending, terminating, or otherwise controlling the maturation and proliferation of cells in stenosis or restenosis. The size of stent and concentration of composition thereon will vary depending on the particular factors of each case, including the type of stenosis or restenosis, the stage of stenosis or restenosis, the subject's weight, and the severity of the subject's condition. These amounts can be readily determined by the skilled artisan. According to one aspect of the invention, a stent is coated with a composition comprising paclitaxel such that the paclitaxel concentration delivered to a subject is greater than or equal to 0.00001, 0.00005, 0.0001, 0.0002, 0.0004, 0.0006, 0.0008, 0.001, 0.002, 0.003, 0.004, 0.005, 0.006, 0.007, 0.008, 0.009, 0.01, 0.05, 0.1, 0.5, 1, 5, 10, 20, 40, 60, 80, or 100 micrograms paclitaxel/mm2 of stent, or a concentration in the range between any two of the aforementioned values inclusive. According to another aspect of the invention, a stent is coated with a composition comprising melatonin such that the melatonin concentration delivered to a subject is greater than or equal to 0.00001, 0.00005, 0.0001, 0.0002, 0.0004, 0.0006, 0.0008, 0.001, 0.002, 0.003, 0.004, 0.005, 0.006, 0.007, 0.008, 0.009, 0.01, 0.05, 0.1, 0.5, 1, 5, 10, 20, 40, 60, 80 or 100 micrograms paclitaxel/mm2 of stent, or a concentration in the range between any two of the aforementioned values inclusive. The concentration of melatonin and paclitaxel per mm2 of stent required to arrive at the above doses can be readily calculated by the skilled person. According to one aspect of the invention, the concentration of melatonin present on a stent may be between 0.001 and 5, 0.02 and 4, or 0.005 and 2 micrograms inclusive melatonin/mm2; preferably it is between 0.005 and 2 micrograms inclusive melatonin/mm2 of stent. According to another aspect of the invention, the concentration of paclitaxel on a stent may be between 0.0001 and 0.5, 0.0005 and 0.003, or 0.001 and 0.2 micrograms inclusive paclitaxel/mm2; preferably it is between 0.001 and 0.2 micrograms inclusive paclitaxel/mm2. Preferably, the concentration of paclitaxel on a stent is lower than the concentration of melatonin. The concentration of paclitaxel may be equal to or less than 0.95, 0.9, 0.85, 0.8, 0.75, 0.7, 0.65, 0.6, 0.55, 0.50, 0.45, 0.40, 0.35, 0.30, 0.2, 0.1, 0.05 times the concentration of melatonin, or may be a fraction of the melatonin concentration which fraction is in the range between any two of the aforementioned values inclusive. Preferably it is between 0.1 to 0.3 times the concentration of melatonin. Experiments by the present inventors indicate inhibition occurs with 0.885 micrograms melatonin/mm2 stent with a paclitaxel concentration of 0.118 micrograms/mm2 stent. A kit according to the invention may comprise at least one stent and separately, at least one composition of the present invention. The kit enables a technician or other person to coat a stent with a composition prior to insertion into a vessel. The composition, besides comprising melatonin and paclitaxel, may contain additional substances that facilitate the coating of the stent by the end-user. The composition may contain, for example, fast evaporating solvents so as to allow the rapid drying of the stent. It may contain polymeric material to allow the melatonin and paclitaxel to adhere to the stent and facilitate its slow release. The composition may be applied to the stent of the kit by any means known in the art. For example, by dipping the stent in the composition, by spraying the stent with the composition, by using electrostatic forces. Such methods are known in the art. It is an aspect of the invention that the composition is provided in a container. For example, a vial, a sachet, a screw-cap bottle, a syringe, a non-resealable vessel, a resealable vessel. Such containers are any that are suitable for containing a composition and optionally facilitating the application of the composition to the stent. Indeed, some polymers to be used for the coating and the controlled release of the active compound, such as polyorthoesters, are extremely unstable, are very sensitive to humidity and should be conserved in a cold atmosphere and in an argon atmosphere for instance. Some active products as well, such as rotenone, are sensitive to light and heat and should be preserved in dark and cold. In such a case, a container with the composition is kept separately from the bare stent. The interventional cardiologist may open the box containing the coating and apply it on the stent just before the intervention. A kit may comprise more than one type of stent and more than one container of composition. A kit may provide a range of stent sizes, stent configurations, stents made from different materials. A kit may provide a range of vials containing separately melatonin, paclitaxel, derivatives of melatonin and/or paclitaxel different and different combinations of polymers. A kit may facilitate the sequential application of more than one type of composition. A kit may contain instructions for use. The invention is illustrated by the following non-limiting examples. They illustrate the effectiveness of the combination of melatonin and paclitaxel described above. The inhibitory properties of the analogues are not mentioned in the examples are known, and the skilled person may readily substitute the exemplified compounds with analogues such as listed above. A composition comprising between 0.05 and 2 micrograms of melatonin and 0.01 to 0.2 micrograms of paclitaxel per square mm of undeployed stent and a suitable polymer is coated onto a balloon inflatable stent. The stent is introduced into a subject suffering from localized vascular stenosis using the percutaneous, transluminal, coronary angioplasty (PTCA) intervention. Six months after the intervention, an angiography is made of the area of the intervention. The degree of restenosis is calculated as a function of the percentage of patent vessel lumen. 1. Evaluation of post-implantation injury and inflammatory response in a porcine coronary model. 2. Evaluation of the relationship between injury and inflammation, 4 weeks after stent implantation. 3. This study has been set-up to compare coated and non-coated bare stents. The bare metal stainless steel stent is a reference stent and serves as a control group. Stents were spray-coated in layers with a matrix layer containing a mixture of melatonin/paclitaxel/PEA and a top layer solely composed of PEA. All handling procedures and spray-coating were performed under cleanroom conditions. Stents were extensively dried under vacuum to remove any solvent residues. PM—melatonin/paclitaxel drug eluting stent, P—paclitaxel drug eluting stent e.g. Taxus stent. The pigs were sedated with 0.2 ml/kg Ketamin (Ursotamin®, Serumwerk Bernburg, Beerse, Germany) plus 0.1 ml/kg Xylazinhydrochlorid 2% (Xylazin®, Riemser Arzneimittel GmbH, Germany) plus 0.08 ml/kg Atropinsulfat (Atropinsulfat®, BBraun Melsungen AG, Germany) before general anaesthesia were induced with intravenous 3-5 ml Propofol (Recofol®1%, Curamed Pharma GmbH, Germany). The pigs were intubated (Endonorm 6.0 F, Rüsch GmbH, Germany) and ventilation were started using a mixture of 30 vol % of pure oxygen, 70 vol % N2O and 1-2 vol % of Isofluran (Isofluran Curamed, Curamed Pharma GmbH, Germany). Throughout the procedure, the electrocardiogram, SpO2 and temperature were monitored continuously. An external carotid artery was surgically exposed and an 6F intra-arterial sheath was introduced over a 0.035″ guide wire. The pigs were sedated with 0.2 ml/kg Ketamin (Ursotamin®, Serumwerk Bernburg, Beerse, Germany) plus 0.1 ml/kg Xylazinhydrochlorid 2% (Xylazin®, Riemser Arzneimittel GmbH, Germany) plus 0.08 ml/kg Atropinsulfat (Atropinsulfat®, BBraun Melsungen AG, Germany) before general anaesthesia was induced with intravenous 3-5 ml Propofol (Recofol®1%, Curamed Pharma GmbH, Germany). The pigs were intubated (Endonorm 6.0 F, Rüsch GmbH, Germany) and ventilation was started using a mixture of 30 vol % of pure oxygen, 70 vol % N2O and 1-2 vol % of Isofluran (Isofluran Curamed, Curamed Pharma GmbH, Germany). Throughout the procedure, the electrocardiogram, SpO2 and temperature were monitored continuously. An external carotid artery was surgically exposed and an 6F intra-arterial sheath was introduced over a 0.035″ guide wire. Coronary imaging was done using a Philips PolyArc fluoroscope connected to a digitizer using an Apple Macintosh Power PC. After follow-up angiography the animals were subsequently sacrificed using an intravenous bolus of 10 ml over saturated potassium chloride (KCl) in deep anaesthesia. Hearts were rapidly excised, the coronary system flushed with 0.9% saline (NaCl) and the arteries fixed by perfusion with 3.5% buffered formalin under physiological pressure and overnight immersion. The target segments were dissected and samples obtained for histology. The stented coronary arteries were harvested for visual inspection of the stent and histopathologic analysis of the stented artery. Coronary imaging was performed using a Philips PolyArc fluoroscope connected to a digitizer using an Apple Macintosh Power PC. Quantitative coronary angiography (QCA) was performed with the CAAS II for Research 2.0.1 System (Pie Medical, The Netherlands). Hearts were rapidly excised, the coronary system flushed with 0.9% saline and the arteries fixed by perfusion with 4% buffered formalin under physiological pressure and overnight immersion. The hearts were sent to an histology facility at Saarland University. Stented coronary arteries were dissected from the formalin-fixed hearts and immersed in methyl-methacrylate (Merck, Darmstadt, Germany). At least three representative cross sections per stent were cut from the blocks with a coping saw, polished, and glued on acrylic plastic slides. Final specimens were stained by HE, Masson Goldner technique. For endothelialization, von-Willdebrand antibody staining was done in selected arteries. After digitalizing, histomorphometric measurements were taken with the NIH image program (PC version ‘Scion Image’, Scion Corporation, Maryland, USA). The evaluated parameters were: luminal diameter, external elastic lamina (EEL) diameter, maximal neointimal thickness, EEL area, luminal area, and neointimal area. Injury scores were assigned as previously described by Schwartz et al. (JACC, 1992, Vol 19(2), p. 267 to 274), and the inflammation score for each individual strut was graded as described by Kornowski et al. (JACC, 1998, Vol 31(1), p. 224 to 230). Angiographic and histomorphometric variables were averaged to obtain a mean value per stent. Continuous variables of quantitative coronary angiography were compared by an analysis of variance model with pig as random factor and treatment, vessel and treatment-vessel interaction as fixed factors using the software SPSS 12.0 for Windows (SPSS Inc., Chicago, Ill., USA). Data will be presented as the mean value±SD. A p value of less than or equal to 0.05 is considered as statistically significant. A summary of imaging and histology results given in Table 2 below, which refers to images presented in the Figures. Imaging and histology results for each animal. The drug eluting stents PM1 and PM2 showed a reduced angiographic late lumen loss after 4 weeks as indicated in Table 3. The Taxus® stent was associated with an increased late loss in this animal model. (PM1), and group 9 PEA-Pacl-Mel 20 μg 150 μg 3-layer coating (PM2). The drug eluting stents PM1 and PM2 showed a trend towards a reduced neointimal hyperplasia after 4 weeks as indicated in Table 4 below. The Taxus® stent was associated with an increased neointimal formation in this animal model. PEA-Pacl-Mel 20 μg 150 μg 3-layer coating (PM2). Stents spray-coated in layers with a the matrix layer containing a mixture of melatonin and paclitaxel lead to a reduction of neointimal formation in the porcine coronary model. the underlying molecular and cellular mechanisms. HCASMC: Smooth Muscle Cell Growth Medium 2: Epidermal Growth Factor (EGF), basic Fibroblast Factor (FGF), Insulin, Fetal Calf Serum (FCS) 5%, Amphotericin B, Gentamicin. Medium was changed every other day. 24 hours prior to growth factor stimulation, the medium was replaced by fresh culture medium, however, without growth factors to increase the cellular sensitivity to the subsequent growth factor stimulation. Subconfluent HCAEC were stimulated with 10 ng/ml of VEGF-A, whereas subconfluent HCASMC were stimulated with 10 ng/ml of PDGF-BB. Likewise, both cell types were stimulated with 25% of human serum (final concentration). To investigate, whether melatonin has similar effects on other cell types, HUVEC (Human Umbilical Vein Endothelial Cells, Promocell) were tested. HUVEC were cultured in the corresponding complete medium (Endothelial Cell Growth Medium: ECGS/H 0.4%, Fetal Calf Serum 2%, Epidermal Growth Factor 0.1 ng/ml, Hydrocortisone 1 μg/ml, basic Fibroblast Factor 1 ng/ml, Amphotericin B 50 ng/ml, Gentamicin 50 μg/ml). 24 hours prior to stimulation, the medium was replaced by a medium containing 2% serum and antibiotics, but devoid of the other complements. Then, HUVEC were stimulated with 10 ng/ml of VEGF-A for 24 hours. Melatonin (Acros organics) was kindly provided by BlueMedical Devices BV. A stock solution was prepared in DMSO, aliquoted and stored at −20° C. For each experiment a fresh aliquot was opened and diluted to the desired final concentration in cell culture medium. All proliferation and cytotoxicity experiments were performed on cells cultured on 96 well plates (Costar). The CellTiter 96 One solution cell proliferation assay from Promega was used to assess cell proliferation in a 96-well plate. This assay makes use of the MTS tetrazolium compound as a cellular substrate. MTS is bioreduced by living cells into a colored formazan product that is soluble in tissue culture medium and absorbs light at 490 nm. The quantity of formazan produced is directly proportional to the number of living cells in culture. After 24 h stimulation, 20 μl of MTS reagent was added to the cells cultured in 100 μl of medium per well. After 2 to 4 hours of incubation at 37° C., 5% CO2, the absorbance at 490 nm was recorded using a 96-well plate reader (Tecan). Cytotoxicity experiments were performed with cells cultured on 96-well plates. The CytoTox-ONE™ Assay from Promega was used to assess the membrane integrity of cells. This test is based on a fluorometric method to estimate the number of non viable cells present in multiwell plates by measuring the release of lactate dehydrogenase (LDH) from cells with damaged membranes. Subconfluent cells were incubated for 48 hours with Melatonin at concentrations between 0.2 and 6 mM. During the 48 h Melatonin incubation, the medium was not changed to avoid removal of any detached cells. As a positive control three wells of untreated cells were incubated with lysis buffer (delivered with the assay) before measurement. At the end of the Melatonin incubation period, a volume of CytoTox-ONE reagent equal to the volume of cell culture medium present in each well was added. After 10 min incubation at 22° C. (room temperature), 50 μl of stop solution was added per 100 μl of CytoTox-ONE reagent added. The plate was shaken for 10 seconds and fluorescence was recorded with an excitation wavelength of 560 nm and an emission wavelength of 590 nm (Spectramax M2 fluorescence plate reader, Molecular devices). HUVEC were incubated for 48 hours with Melatonin and stimulated for 24 hours with VEGF-A at 10 ng/ml. After 24 hours of stimulation, the cells were incubated with radioactive [3H]-thymidine. Two hour later, the medium was removed and cell-bound DNA was precipitated using 5% TCA (Trichloroacetic acid). Then, [3H]-thymidine incorporation was measured using a beta-counter. Chemotaxis experiments were performed using a modified Boyden chamber. The apparatus consists of two multi-well chambers separated by a filter containing pores of uniform size. A solution containing a chemokine or chemotactic factor is placed in the lower/bottom chamber and a cell suspension is placed in the upper chamber. Cells can migrate through the pores across the filter and towards the chemoattractant in the lower chamber. Cells that migrated across the filter and remain attached to the lower side of the membrane are counted. Data are expressed in terms of migration index: the number of cells that migrated in response to agonist stimulation compared to the number of cells that migrated randomly, i.e. to medium only. Chemotaxis experiments so far were only performed with HCAEC. For these cells a 25×80 mm polycarbonate filter, polyvinylpropylene (PVP) free was used (Whatman) with a pore size of 8 μM. Before migration the filter was coated with collagen. Endothelial cells were incubated with Melatonin at 2 mM prior to and during migration. After 24 hours pre-incubation with Melatonin, untreated and Melatonin-treated cells were detached with trypsin and a cell suspension (0.5 million cells/ml) was loaded in the upper part of the chamber. Cells were stimulated with VEGF-A at 10 ng/ml. Cells were allowed to migrate for 4 hours at 37° C./5% CO2. At the end of migration, cells were fixed on the filter, stained with Giemsa and counted using a regular optic microscope. In the first experiment, the proliferation kit was calibrated for smooth muscle cells. HCASMC were seeded at different concentrations. After 4 days, the cells were stimulated with 10 ng/ml of PDGF BB for 48 h. The results are presented in FIG. 63. Based on the results of this experiment, the decision was taken to perform all following experiments with a cell concentration for seeding of 2500 cells per well. The effect of Melatonin was then tested on HCASMC at concentrations ranging from 1 μM to 10 mM, and was applied either 24 h or 96 hours prior to growth factor stimulation. Melatonin was also present during stimulation with growth factors. Cells were stimulated for 24 h with 10 ng/ml of PDGF BB. A concentration of Melatonin up to 0.1 mM showed no significant effect on the proliferation of HCASMC (FIG. 64). A 24 hours pre-treatment of the cells with 1 mM of Melatonin induced a significant decrease in the number of smooth muscle cells. This effect was even more pronounced, when the incubation time of Melatonin was increased up to 96 hours prior stimulation. The Melatonin-induced inhibition could not be counteracted by stimulation with PDGF-BB. This is the first description of a time-dependent inhibition of Melatonin on HCASMC. Stimulation of the cells with 25% of human serum led to similar results (data not shown). The maximal inhibitory effect of Melatonin was observed at 5 mM (FIG. 3). At higher concentrations (up to 10 mM), no significant further increase in the inhibitory effect could be obtained. Melatonin was then tested on human coronary artery endothelial cells (HCAEC). The cells were first seeded at a concentration of 3000 cells per well, but it appeared that this concentration was too high to perform an experiment over a period of 4 days. For all following experiments, the cells were therefore seeded at a concentration of 1000 cells per well. Melatonin was tested at concentrations between 1 μM and 6 mM on subconfluent cells (FIG. 66A). The results obtained with HCAEC were comparable to those obtained with HCASMC. Up to a concentration of 0.1 mM of Melatonin, the HCAEC were not sensitive to Melatonin. At Melatonin concentrations between 1 mM and 6 mM, a dramatic decrease in cell number could be observed with a maximal effect seen at 3 mM and 6 mM. In general, HCAEC appeared to be more sensitive to Melatonin than HCASMC. A stimulation with VEGF A (10 ng/ml) did not overcome the inhibitory effect induced by Melatonin (FIG. 66 B). Taken together, these results show that Melatonin induces a decrease in cell number. Two reasons for this effect are possible: 1) Either Melatonin acts as an anti proliferative compound or 2) Melatonin is cytotoxic for the cells. To answer this question, HCAEC and HCASMC were treated with Melatonin and their membrane integrity was subsequently tested using the CytoTox-one assay from Promega (FIG. 67). To investigate a possible cytotoxic effect of Melatonin on both HCAEC and HCASMC, the two cell types were treated during 48 hours with increasing Melatonin concentration. The amount of LDH released by dead cells was then measured. The results are presented in FIG. 67. Based on these results, it can be concluded that Melatonin does not induce any detectable cytotoxic effect on HCAEC (FIG. 67A) nor on HCASMC (FIG. 67B) in this in vitro setting. The goal of the following experiment was to investigate, whether Melatonin was able to induce similar effects on HUVEC as it did on HCAEC and HCASMC. For this purpose [3H]-thymidine incorporation experiments were performed on this cell type to assess DNA synthesis and proliferation. The cells were incubated for 48 hours with increasing concentrations of Melatonin and stimulated for 24 hours with 10 ng/ml of VEGF A prior to incorporation of [3H]-thymidine. The results are presented in FIG. 52. In view of these results, it can be concluded that HUVEC were more sensitive to Melatonin (and to DMSO) compared to HCASMC/HCAEC. Already a concentration of 0.2 mM showed an inhibitory effect on HUVEC, which was not the case for the other two cell types. It cannot be excluded that the number of cells was decreased by Melatonin treatment, but VEGF-A induced [3H]-thymidine incorporation was completely inhibited. The cells were somewhat sensitive to DMSO (negative control), but DMSO-treated cells were still responsive to VEGF-A and incorporated [3H]-thymidine upon VEGF-A-stimulation. HCAEC were treated with 2 mM of Melatonin for 48 hours and their chemotactic response towards VEGF-A (10 ng/ml) was assessed (migration for 4 hours). The results are presented in FIG. 69. Melatonin at a concentration of 2 mM, which led to the inhibition of HCAEC proliferation (FIG. 66B), did not have any significant effect on the chemotactic response of these cells. Thus far, this experiment was performed only once and the results need to be confirmed. The aim of the experiments was to identify the direct effects of melatonin on human vascular cells and to elucidate the underlying molecular and cellular mechanisms. The results obtained in the first part of the experiments clearly show that melatonin strongly inhibits the proliferation of human coronary artery endothelial cells (HCAEC) and human coronary artery smooth muscle cells (HCASMC) at concentrations higher than 0.2 mM. Melatonin shows no cytotoxic effects so far and does not impair the migratory capacity of human coronary artery endothelial cells. Melatonin has comparable effects on human umbilical vein endothelial cells (HUVEC), which however can be observed at lower concentrations. The results presented in this study clearly show that Melatonin strongly inhibits the proliferation of HCAEC, HCASMC and HUVEC. Melatonin shows no cytotoxic effects and does not impair the migratory response of endothelial cells towards the endothelial growth factor VEGF-A. These support the finding that Melatonin is a good drug candidate for the prevention of restenosis following PCI, to be applied in a local drug-delivery setting (drug eluting stent). 1. A medical stent comprising a composition comprising melatonin and paclitaxel. 2. The medical stent according to claim 1, wherein said stent comprises one or more cavities configured to contain and release said composition. 3. The medical stent according to claim 1, wherein said stent is at least partly made from a material which is biodegradable in situ. 4. The medical stent according to claim 1, wherein said stent comprises a magnesium based alloy. 5. The medical stent according to claim 1, wherein said stent is at least partly made from a material which is non-biodegradable in situ. 6. The medical stent according to claim 1, wherein said stent is at least partly provided with said composition. 11. The medical stent according to claim 1, wherein said composition further comprises one or more slow release agents to facilitate slow release of inhibitor. 12. The medical stent according to claim 11, wherein said slow release agent is any of magnesium alloys, poly(glycolic) acid, poly(lactic acid) or in general glycolic- and lactic acid based polymers, copolymers, polycaprolactones and in general, polyhydroxyl alkanoate,s poly(hydroxy alcanoic acids), Poly(ethylene glycol), polyvinyl alcohol, poly(orthoesters), poly(anhydrides), poly(carbonates), poly amides, poly imides, poly imines, poly(imino carbonates), poly(ethylene imines), polydioxanes, polyoxyethylene(poly ethylene oxide), poly(phosphazenes), polysulphones, lipids, polyacrylic acids, polymethylmethacrylate, polyacrylamides, polyacrylonitriles (Polycyanacrylates), poly HEMA, polyurethanes, polyolefins, polystyrene, polyterephthalates, polyethylenes, polypropylenes, polyetherketones, polyvinylchlorides, polyfluorides, silicones, polysilicates (bioactive glass), siloxanes (Polydimethylsiloxanes), hydroxyapatites, lactide-capronolactone, natural and non natural polyaminoacids, poly-β-aminoesters, albumins, alginates, cellulose/cellulose acetates, chitin/chitosan, collagen, fibrin/fibrinogen, gelatin, lignin, protein based polymers, Poly(lysine), poly(glutamate), poly(malonates), poly(hyaluronic acids), polynucleic acids, polysaccharides, poly(hydroxyalkanoates), polyisoprenoids, starch based polymers, copolymers thereof, linear, branched, hyperbranched, dendrimers, crosslinked, functionalized derivatives thereof, or hydrogels based on activated polyethyleneglycols combined with alkaline hydrolyzed animal or vegetal proteins. 13. The medical stent, according to claim 11, wherein said slow release agent is a biodegradable poly(ester amide) copolymer. 14. The medical stent, according to claim 1, wherein said melatonin is a mixture of at least one melatonin analogue optionally together with melatonin. 15. The medical stent, according to claim 1, wherein said paclitaxel is a mixture of at least one paclitaxel analogue optionally together with paclitaxel. 16. The medical stent, according to claim 14 wherein the melatonin analogue is selected from the group consisting of 2-iodomelatonin, 6-chloromelatonin, 6,7-dichloro-2-methylmelatonin 8-hydroxymelatonin and combinations thereof. 18. The medical stent, according to claim 1, wherein the concentration of melatonin present on the stent is between 0.005 and 2 micrograms inclusive melatonin/mm2. 19. The medical stent, according to claim 1, wherein the concentration of paclitaxel on the stent is between 0.001 and 0.2 micrograms inclusive paclitaxel/mm2. 23. A method for treating smooth muscle cell (SMC) proliferation comprising implanting a medical stent according to any one of claims 1 to 6 and 11 to 19 in a mammal. 24. The method according to claim 23, wherein said SMC proliferation is restenosis or stenosis. 25. The method according to claim 23, wherein the stent is implanted in an artery or vein. 26. A kit comprising the medical stent comprising a composition comprising melatonin and paclitaxel as defined in any one of claims 1 to 6 and 11 to 19.